The Taxi of Tomorrow, a purpose-built taxicab made by Nissan for New York City, is being prepared and tested prior to its Fall 2013 launch. 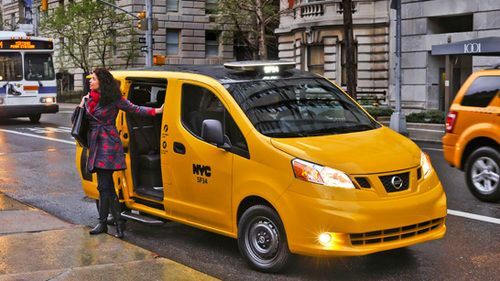 The NYC Taxi of Tomorrow program has taken a big step closer to fruition with a prototype Nissan NV-200 based taxi now in operation on New York City streets. The Taxi of Tomorrow program is NY City's attempt to re-envision the taxicab and the whole taxi experience, to serve ergonomic, cost and environmental goals. The NV-200 is a van built by Nissan that can serve many purposes. In 2012 New York City chose the NV-200 as the basis for the Taxi of Tomorrow, and while many of these taxi's will be gasoline powered some will be electrically powered. The NV-200 is slated to come in an electric version built using electric vehicle drive train technology borrowed from the Nissan Leaf. The Taxi of Tomorrow program is meant, over a period of several years, to replace New York City's existing taxi fleet with vehicles purpose designed to serve as taxi's. This means the taxicab experience won't be a bolted-on afterthought, but instead it will be purposely designed as a taxicab. For example, the safety barrier will be designed as part of the vehicle. Among the advantages is that it will meet crash test safety standards in its taxicab configuration. Over the next few years the NY City taxi fleet will be replaced with NV-200 based Taxi's. To get ready for this, Nissan has held a few milestone meetings with stakeholders. One of those was a first ride-review of the Taxi of Tomorrow for NYC officials at its proving grounds in Arizona last fall. The latest is occurring now, and has an NV-200 based taxi operating on NY CIty streets. Nissan also deployed six Nissan Leaf's in 2012 in New York City for taxicab duties to test driver acceptance. The press release issued by Nissan did not mention that pilot project. A similar deployment of Nissan Leaf's for taxi service in Osaka Japan has met with troubles. According to a report in the Japan Times, the Osaka taxi drivers were at first happy with the Nissan Leaf taxi's. They're not fatiguing to drive, but instead just glide along making for a more pleasant driving experience. But that happiness has turned to frustration. The issue is range degradation over the life of the vehicle, as well as the recharge time required. The range has deteriorated to about half of what it was when the taxi's were new, almost certainly due to frequent fast charging required to keep the taxi's on the street. "You feel like the space is designed for you, the passenger, as opposed to the taxis that we have today where it is kind of a thrown together feel," said Commissioner David Yassky, New York City Taxi and Limousine Commission.